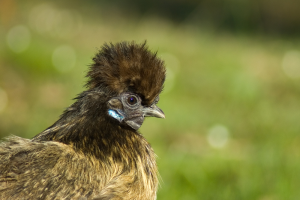 Are Silkies bantams or standard fowl? 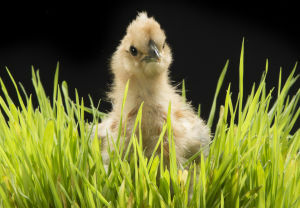 How many types and sizes are there of silkie bantam? 1. The miniature or bantam Silkie - These are small with the males topping the scales at 600g (22ozs) and hens at 500g (18ozs). 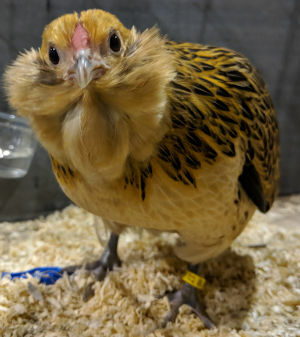 Below: A bantam silkie hen in a showcage. 2. Standard fowl - Large Fowl Silkies weigh in at 1.8 kg (4lbs) for the males and the hens at 1.36kg (3lbs). 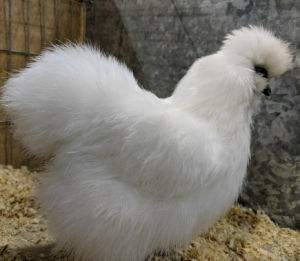 Below: a full size Silkie cockerel in a showcage. This is not the case everywhere in the world, some places only have the bantam. 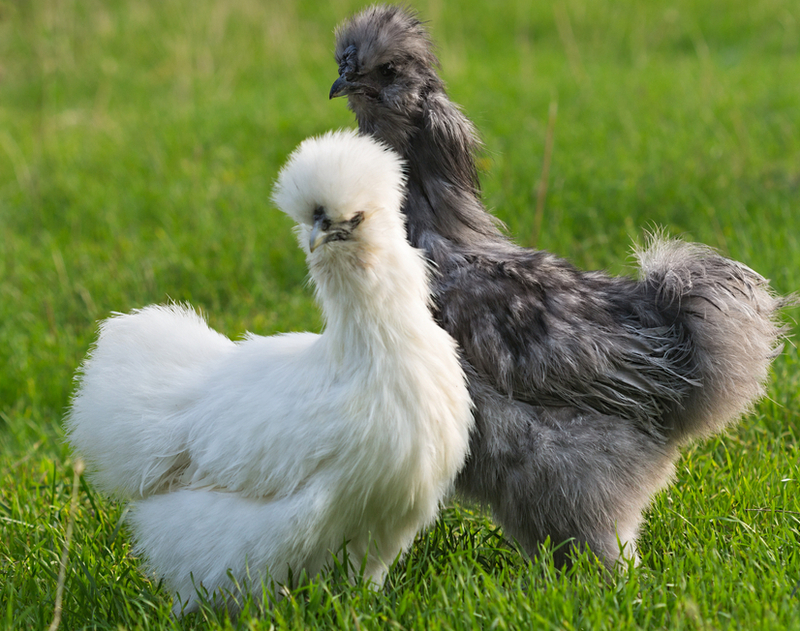 There are two other types as well, Silkies can also be bearded or without beards and showgirl silkies have the naked neck gene. Below: A bearded Silkie with a large tuft on its chin. 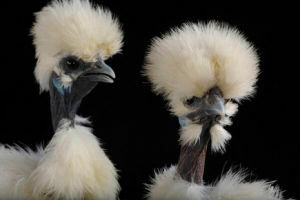 Showgirls are a modern sport of the silkie and have become increasingly popular recently. They are the result of crossing Transylvanian Naked Necks with Silkies. Below: Full grow showgirl pair. Not all the sub-types are allowed in the standards. 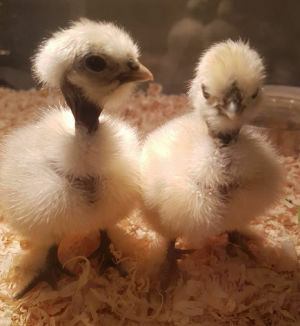 What is the difference between a bantam and a standard Silkie? 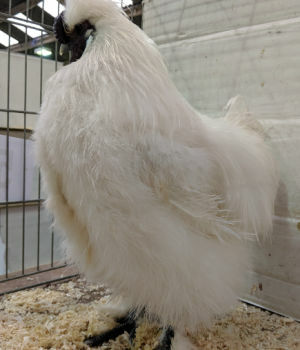 Silkies are considered a bantam breed in some countries, but this varies according to region and many breed standards class them officially as large fowl. The bantam Silkie is actually a separate variety most of the time and as the size varies from region to region it can be very confusing. In the US only bantams are recognised, and there are very few that are larger than bantams. In other countries, different weights and standards apply. 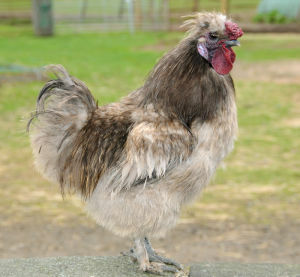 ALL silkies began as bantams. Large fowl were bred up from the bantam. I bought a clutch of silkie chicks from a breeder last year and they are now fully grown and equal in size to my leghorns. The hens weigh 4-5 pounds each. A silkie breeder group told me that they are not really silkies if they are that large and that hatchery silkies are crossbred with whatever is available. 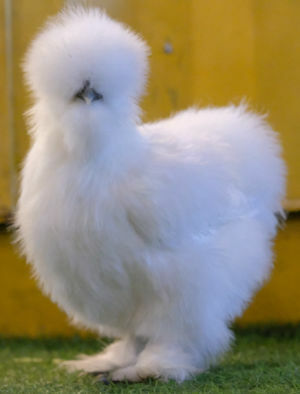 So, I have a fluffy, silkie-feathered chicken, but it's too big to be a silkie. Below: A silkie without a beard. 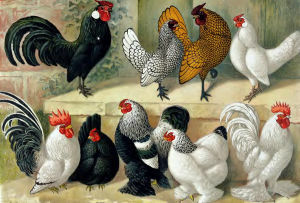 Almost all North American strains of the breed are bantam-sized, but in Europe the standard-sized is the original version. 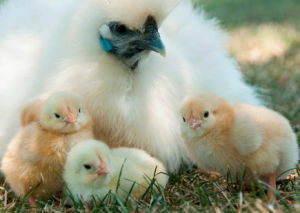 However, even standard Silkies are relatively small chickens, with the males weighing only four pounds (1.8 kg), and females weighing three pounds (1.36 kg). The American Standard of Perfection calls for males that are 36 ounces (1 kg), and females that are 32 ounces (910 grams). I have both sizes of Silkie. The larger males which I have three are around 3 pounds, then I have 2 more male Silkies that his weigh around 1+1/4 pound. They all have only 4 hens each.